Take your fitness to the next level with one of our specialty fitness, yoga, SUP yoga or kids fitness classes. AdvoCare offers high quality products to fill nutritional gaps, and aid in weight loss, energy and sports performance. Quest hosts workshops and events to improve your knowledge and skillset for all aspects of health and fitness. We create custom programs for businesses and corporations to encourage wellness in the workplace and help to lower healthcare costs. We measure the rate at which your body burns calories and create nutrition plans tailored to your metabolic profile to help you reach your goals. Receive in-person or on-demand wellness coaching or private instruction to help you reach your health and fitness goals. Exclusive offers for new members! Sign up today! 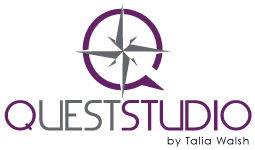 Quest Studio is my absolute favorite place to workout! The workout classes are excellent and the instructors and other members make for a great community. I have been working with Talia for just over 1 year. With the help of her metabolic testing, discovering my true daily calorie burn, I have been able to drop my body fat percentage 5% and lose 15lbs of pure fat. She is very knowledgeable, willing to teach and help you achieve your goals. I came home from college for the month and wanted to find somewhere to do yoga while I was home. Quest has welcomed me in like I have always gone there and gives me one more thing to miss about home.